On a October afternoon in 1948, daylight barely trickled into the storefronts of Donora, Pennsylvania. Stagnant weather had trapped a noxious black cloud of emissions from nearby steel and zinc plants above the town, nestled in a valley just southeast of Pittsburgh. When the cloud finally lifted five days later, 21 townspeople were dead and countless others hospitalized. It was one of the worst air pollution disasters in U.S. history, and Harvard School of Public Health took notice. In the wake of Donora, a fresh wave of faculty research would lead both to a new understanding of air pollution’s impact on health, and to sweeping federal reforms restricting those emissions. Since the beginning, HSPH has built a legacy on its response to environmental disasters like these. 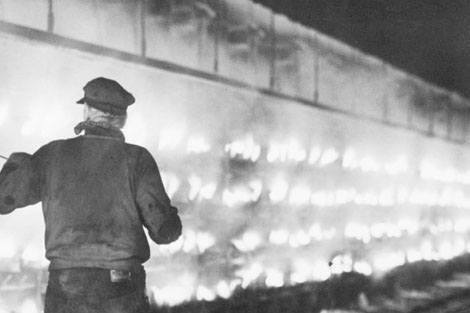 Through years of influential research and public health activism, the school has transformed both science and policy, leading steadily to healthier environmental conditions in our cities, towns, and workplace —environments that, in the decades before Donora, could sometimes be deadly. When HSPH was founded in 1913, U.S. labor regulations were almost nonexistent. Coal dust choked the lungs of miners. Mercury poisoned the brains of felt hat makers. And lead, used in everything from freight car seals to pottery decoration, caused horrible convulsions in exposed workers. “While European journals were full of articles on industrial poisoning, the number published in American medical journals up to 1910 could be counted on one’s fingers,” recalled occupational health pioneer Alice Hamilton in her 1943 autobiography, Exploring the Dangerous Trades. Before joining Harvard’s faculty in the late 1910s, Hamilton had built her career studying the plight of American workers—first, by running a survey of lead poisoning in Chicago, then later by examining workers sickened by picric acid, a byproduct of making explosives. In the course of her studies, she exposed dangerous workplace practices and pushed tenaciously for industrial reform. In 1923, workers at a New Jersey clock and watch plant—mostly women developed painful abscesses that disfigured their jaws and faces. Their teeth started falling out, and within months, the women became so sick, they could barely move. Future HSPH Dean Cecil Kent Drinker soon discovered the culprit: a new type of glow-in-the-dark paint made with radium, a radioactive element. When the workers painstakingly dabbed the paint onto clock and watch dials, the researchers found, they licked their brushes to “point up” for better detail, ingesting tiny bits of the radioactive substance. It slowly collected in their gums and jawbones, dooming the women to a painful death by radiation poisoning or cancer. Drinker’s survey of the workers provided one of the world’s first academic studies on the effects of radiation, helping open the world’s eyes to the terrible dangers it posed. By the end of the Second World War, Drinker and Hamilton’s legacy of research and activism left U.S. factories safer than ever before. New regulations for both chemical and radioactive exposure protected workers’ health to a large extent, and job-related illnesses fell to an all-time low. Ironically, though, outside factory walls, regulations stayed lax, and dangerous chemicals were released into the air in communities around the country. As they were, HSPH would again find itself on the front lines. In the years after the war, HSPH studies found direct connections between airborne pollutants and health problems like asthma, lung cancer, and chronic respiratory disease—findings that would later be the scientific bedrock for regulations mandated in the 1970 Clean Air Act. While the new act reined in some of the country’s worst air pollution, Benjamin Ferris, HSPH professor of environmental health and safety, felt more research was needed. Yes, caustic smog could kill, he noted—but how, exactly? In 1974, Ferris and a team of HSPH colleagues began to find out. In a study of epic proportions, the group spent more than a decade traveling to six cities around the Midwest and New England—in areas of low, medium, and high pollution—to record the respiratory health of more than 8,000 adults and 14,000 children. At the same time, Ferris and his team measured nearby levels of suspended particles (soot), sulfur dioxide, nitrogen oxide, and ozone. The study’s findings, published in 1993, were striking. Death rates in the most polluted of the six cities (Steubenville, Ohio) were 26 percent higher than in the cleanest city (Portage, Wisconsin), showing a strong link between community air pollution and shortened life expectancy. Indoor air quality was also an important factor in participants’ health. Pollutants could be trapped inside homes and offices, where residents would inhale a concentrated dose of particulates, tiny solids and liquid droplets that emerge during combustion and stay suspended in midair. The particles’ microscopic size— in some cases, more than 100 times narrower than an average human hair—let them slip deep into the lungs, transporting dangerous chemicals into the body and causing harmful inflammation. In part based on the School’s study, the U.S. Environmental Protection Agency (EPA) passed new particulate regulations in 1997, a controversial move continued that sparked immediate political backlash. Meeting the new requirements wouldn’t be cheap, after all—retrofitting power plants, steel mills, and other heavy industrial sites would cost millions. As pressure rose from industry lobbyists and members of Congress, the Harvard team agreed to an independent reanalysis of its data by the Health Effects Institute (HEI), a research organization in Cambridge, Massachusetts. HEI—which was funded by both the EPA and the automotive industry—took three years to sort through the small mountain of data. But when the results were released in 2000, it had confirmed the Harvard team’s findings, quieting the storm of criticism that followed the study’s publication. Since then, follow-up studies by HSPH faculty have revealed even stronger links between particulate exposure and cardiovascular disease, and today, researchers are pushing for more stringent regulations. While Ferris and his team traveled the country to study air pollution and smog, however, a second group of HSPH faculty set out to tackle another urgent environmental issue—water pollution. By 1982, one of the nation’s most infamous cases reared up in Harvard’s own backyard. When the Boston suburb of Woburn, Massachusetts, installed new municipal wells in the mid–1960s, residents immediately complained. The water smelled and tasted bad, and it corroded pipes and faucets. Something about it just seemed wrong. Despite assurances of safety from city hall, more than a dozen Woburn children were diagnosed with leukemia after the wells went online, and residents’ suspicion of the water supply grew. In 1979, the town’s fears seemed confirmed: A construction crew uncovered barrels of toxic waste near the wells, and tests found high levels of industrial solvents in the water. But did those chemicals cause the rise in cancer rates? The riddle intrigued Marvin Zelen, a biostatistician at HSPH. He and colleagueStephen Lagakos soon dove into a statistical study of more than 7,000 Woburn residents, collecting family medical histories through phone surveys and door-to-door volunteers. Indeed, the study introduced the idea of citizen epidemiology—recruiting local residents to gather data. The study’s results showed that the townspeople were right all along. The more water a household received from the tainted wells, the higher its chances of childhood leukemia or birth defects. At first, Zelen’s results were not universally accepted, even by some HSPH colleagues. Brian MacMahon, then-chair of the Department of Epidemiology, argued that since Zelen and Lagakos’ volunteers were themselves Woburn residents, the study might be unduly biased. While a subsequent trial and the EPA’s newly instituted oversight offered some recourse to Woburn residents, it may not have seemed like much to those who had lost loved ones to leukemia. Still, as frustrating as it may have been, the town seemed to have far more options than cities halfway across the globe. Similar sorts of industrial and environmental illnesses were commonplace in developing nations during the 1980s, and little help existed—except, that is, for the work of HSPH researchers. By the late 1980s, the rapid growth of industry in developing nations had triggered a new wave of environmental health concerns. Countries such as China began to face scenarios eerily similar to the industrial revolution in the United States: smog obscured skylines, chemicals tainted water supplies, and lax labor regulations endangered thousands of factory hands. 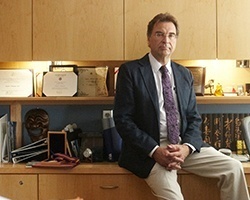 In Shanghai’s massive cotton mills, said HSPH researcher David Christiani, Elkan Blout Professor of Environmental Genetics, respiratory disease was commonplace: workers came down with chronic cough, bronchitis, and an asthmalike condition called byssinosis, caused by bacterial toxins thrown into the air during cotton processing. In 1986, Christiani set out to examine those illnesses. After recruiting more than 1,000 employees from two Shanghai textile mills, he and a small team of researchers began the first study of respiratory health ever among Chinese textile workers. Christiani followed up with the cohort regularly for the next 30 years, providing valuable data on the relationship between bacterial compounds called “endotoxins” and lung disease. As his team soon discovered, repeated exposure to the toxins, which normally have only a short-term effect on the lungs, could cause permanent damage. “We were the first to show that chronic lung-function loss was related more strongly to prolonged endotoxin exposure than to cumulative dust,” Christiani recalled in a 2007 interview. Today, Harvard School of Public Health continues breaking new ground in environmental research. Here at home, it continues its tradition of studying toxins in our surroundings—from the effects of mining waste in Tar Creek, Oklahoma, to careful analysis of BPA, a compound found in some food-grade plastics that can cause hormonal changes in humans. HSPH also has international partnerships to study air pollution in Mexico City and water contamination in Bangladesh, as well as close collaborations with the National Health and Family Planning Commission of China (formerly the Ministry of Health) and Tsinghua University that began in 2005. That collaborative effort, part of the HSPH China Initiative, immediately kicked off a wide-reaching series of policy dialogues and studies to address environmental health in a nation facing rapid urbanization. This article, ghost-written for Harvard School of Public Health, appeared in special publications commemorating the institution’s 100th anniversary.